Martin Bohm is a widower and single father who is haunted by an inability to connect to his emotionally challenged 11-year-old son Jake. But when Martin discovers that Jake can predict events before they happen, everything changes. I had the pleasure of reviewing, Touch Season One on DVD. The acting in this show is fantastic and the storyline is interesting. The only issue is the event ties are sometimes a little vague but as you get the feel for the show that lessens to some degree. If you were to watch this as it unfolds on TV each week the storylines are very intricate so people are not gonna want to walk in and out on it otherwise you'd definitely miss something and get lost by the time you got back. I love the show though so I wouldn't walk in and out on it. That's why if you're a fan of the show purchasing season one is a must. You never know what you might have missed even if you didn't leave the room while watching it. Disclosure: All opinions are my own. 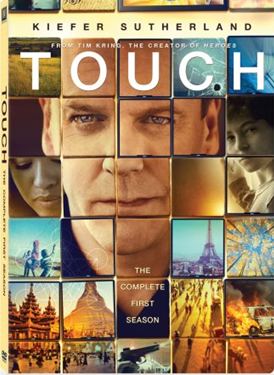 I received Touch Season One on DVD at no cost for the purpose of this review. No other compensation was received.